This resource is for anyone that uses Blackboard, not just online instructors. 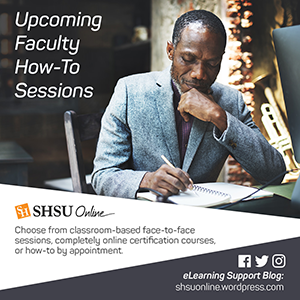 SHSU Online encourages you to join this growing community and take part in the cognitive surplus of ideas, resources, and conversations around eLearning. Visit community.blackboard.com to join today! ← Adding due dates to assignment descriptions? Use the #DayNotDate in conjunction with Blackboard’s Due Date option. Adding due dates to assignment descriptions? Use the #DayNotDate in conjunction with Blackboard’s Due Date option. Follow the Blog via e-mail!